Local greatness on display in small works of art. Clint gives us a floor by floor walk through and some inspiration as well. The Roots + Wires Presents Winter Series brings three stellar evenings of music to Taos. 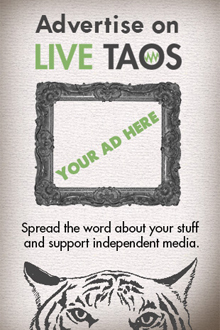 Drink some beer and support Taos Clay's resident artist program. Valentine's Day is coming up! Hannah tells it like it is.